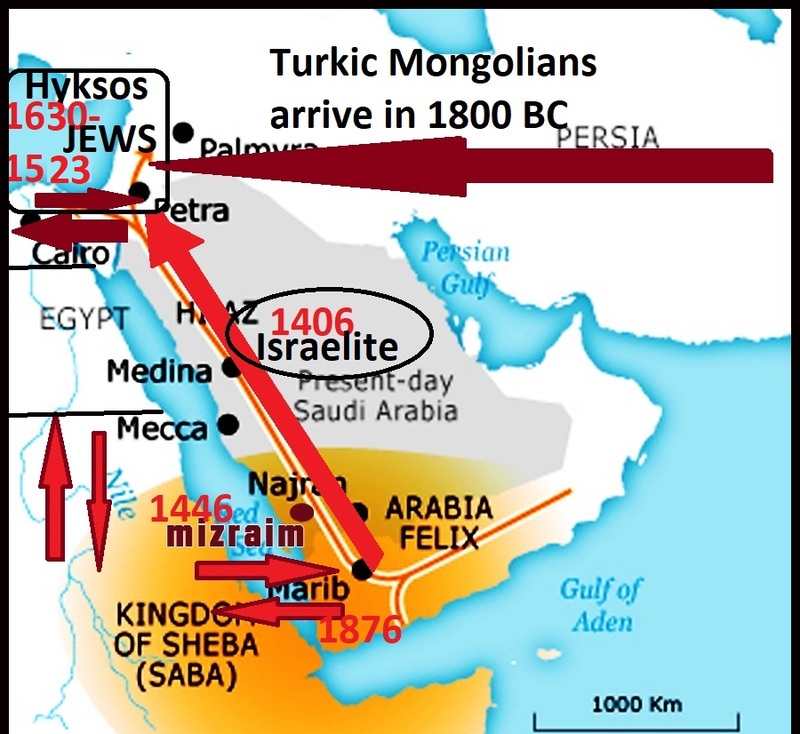 The Jews are Turkic Mongolian raiders; they were looting in Canaan and the whole Levant hundreds of years before the arrival of the Israelite (Arab Semite Yemeni Semite) to Canaan in 1406 BC from Yemen. The Jews and the Israelite are two different ethnic groups. The Jews were pagans and the Israelite were disobedient and forgers for the teachings of Moses. The Israelite never went to Egypt; and even Abraham didn’t. The Israelite too refuge in Abyssinia (ancient Ethiopia) for 430 years (from 1876 to 1446 BC). They caused a lot of slavery, damages and harm to Abyssinia and to Kerma (ancient Nubia) and caused its collapse. The Israelite made unlawful businesses with the Jews who colonized north Egypt and were known as the Hyksos (1630 -1523 BC). After the Israelite were expelled from Abyssinia in 1446 BC (Biblical Exodus) they moved from Yemen to join their former business partners the Jews in Canaan and Levant. Before the Persian war of 605 BC the Israelite occupied and ruled Canaan and used the names of Samaria and Jerusalem to point to the two different Israelite coalitions. They didn’t use the terms Kingdom of Israel and Kingdom of Judea. These two names came much later and were invented by the Jews to allege that the origin of the word JEW is from Judea. It is impossible and illogical that the Samarian group secede and take with them the name of the former state and leave behind the capital. After the tricky Babylonian return in 530 BC the Jews kicked out their former partners the Israelite. All Arabia became Turkic and the Arabs disappeared as an ethnic group. Those Arabic speaking groups are not Arabs but Turkic Mongolians. The Arabs didn’t have weapons or horses or even camels or tribal organization to put any resistance to the aggressive Turkic Mongolians. The term JEW has nothing to do or any relation with Judah or Judea, or Israel. YEWH = JEW appeared before Judah son of Jacob and at completely different far place. Ye-hu-dah comes from YHWH which became Jew. Ye-hu-dah didn’t come from Judah. Haaretz and the state of Israel are telling total false information of the worst level. Why Are Jews Called Jews? There is no any ethnic relationship between Jews and Israelite. The only similarities are their similar behavior and illegal claims of Canaan. The Israelite allege they were given this land by God EL “Allah”; and the Jews claim they are the Israelite who were given Canaan! Actually 200 years of Jewish looting of Canaan before the arrival of Israelite is a very conservative figure. The presence of Jews preceded the Israelite in Canaan could be 300 years (since 1700 BC). At that time the Ten Commandments and the Books of Moses were non-existent. Which makes the Jewish claim of religious legitimacy and any ethnic relationship to the Israelite a clear forgery.